Ryan Gander, Ftt, Ft, Ftt, Ftt, Ffttt, Ftt, or . . ., 2010, mixed media, dimensions variable. Humorous, but not a one-liner; childlike, but not naive; indebted to the everyday, but not at random—Ryan Gander’s output unites the qualities necessary to being light-footed and conceptual in equal measure. “Make Every Show Like It’s Your Last,” a survey exhibition covering approximately the past ten years of Gander’s work, displays how the Brit handles divergent themes with masterful ease and how, in the process, he has developed a formal language that couldn’t be more contemporary. This becomes clear in his works that make art-historical references: The photograph It’s Got Such Good Heart in It, 2012, presents a twine-wrapped Sol LeWitt–inspired sculpture that he mounted for the big cats in Mexico City’s Chapultepec Zoo. For Ftt, Ft, Ftt, Ftt, Ffttt, Ftt, or . . 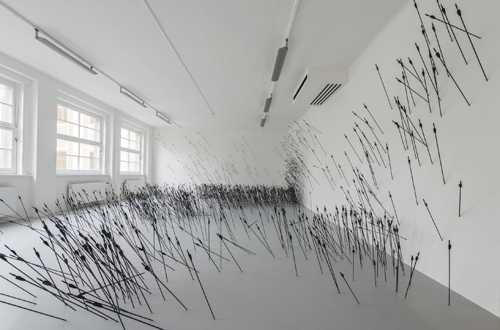 ., 2010, a gallery is consumed by countless arrows. The title of this work, which operates within the contrast between the black objects and the white space, alludes to the Dutch artist and architect Theo van Doesburg, whose aversion to the right angle and penchant for the diagonal Gander has translated into a three-dimensional form. Many of the more than two dozen works exhibited draw on the everyday life of the artist. I Is . . . (v) and I Is . . . (vi)_, both 2013, are sculptures made of marble dust that feature chairs, trestles, and other furniture the artist’s daughter had covered with sheets. These cavernous hideouts present not just the poetry of the quotidian but also the playful aspect of Gander’s art. The exhibition in Linz will certainly not be his last. Translated from German by Diana Reese.